30 september 2015 11:30 - 9 MIN. Het schandaal rond Volkswagen laat voor de zoveelste keer zien waar het in het bedrijfsleven in de kern aan schort: ethiek. Columniste Roxane van Iperen interviewde eerder dit jaar professor Maurice Punch. Het werd een gesprek over ethisch zakendoen, leiderschap, het verschil tussen individuele en collectieve moraliteit en over de excessen van het neoliberale business model. Het interview is actueler dan ooit (tekst in het Engels). For her research on Corporate Responsibility and Business Ethics in Neoliberal Society, Roxane van Iperen had the opportunity to meet an authority on the matter: Professor Maurice Punch of the London School of Economics and Political Science, and King’s College London, former professor at Nyenrode. 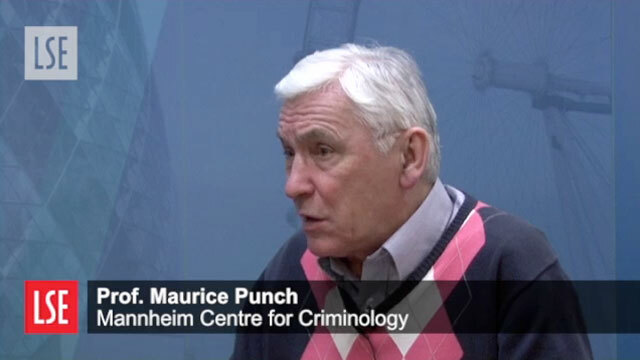 Specialised in corporate crime and ethics as well as corruption and reform of police organisations, he has been doing research since the 1970’s and wrote numerous books on both topics (Dirty Business: exploring corporate misconduct, Rethinking Corporate Crime, Shoot to Kill: Police, Firearms and Fatal Force.). In your book Dirty Business: exploring corporate misconduct, written in 1996, you discuss cases of corporate deviance. That was before the financial crisis hit worldwide. Has the situation changed since then? 'Yes. The business scandals that I deal with in my book occurred within a corporation, within a branch of business or in a specific country. But what we’ve seen in the last fifteen years is entire economies almost being destroyed. I can give you an example, which is Ireland. There is a very interesting book written by a journalist called O’Toole: Ship of Fools: How Stupidity and Corruption Sank the Celtic Tiger. It is the analysis of Ireland's economic debacle, with a lot of data on how the elite - the business elite, the political elite and the regulatory elite - all work together to rip society off. It’s kind of predatory, and what are the stakes? The stakes are no longer: you have manipulated the market. No, the stakes are: you are destroying the environment. The stakes are: you are using unethical methods to test drugs in third world countries; you are buying your way into markets through corruption. It’s about this almost destructive nature of capitalism. Look at the risks and dangers of neoliberal governments, with deregulation, with global markets. Look at what’s happening to society, how societies are being undermined in a way. There is no work for people, the way the environment is being used, the way China is everywhere buying all minerals and resources. So I think the stakes are much higher now and the consequences much deeper.' The time has come that people have to step back and also think about what the consequences are for companies. For example: Shell having to give compensation in Nigeria for environmental damage. They are not admitting guilt, but they are forced to rethink. At the same time you see parts of the media and the press are being quite aggressive, depending on the society and how far they are willing to go. What you see in the UK and the US, is, besides much of the media controlled by one man like Murdoch, there are usually one or two pioneering papers like The Guardian and The Observer, and a few of those really investigatory journalists. So fortunately you still have that, but the stakes are now so much higher that it is essential for people in society to ask the right questions about the responsibility of companies. Look at how our medical services are being dictated by the insurance companies and pharmaceutical industries. They are saying which pills you can have, what hospitals you can go to, whether you can have your choice of doctor or not. The power of these people, these companies, is becoming immense. And they are being supported by the governments. A lot of business people I work with believe there is a conflict between making large profits and being ethical. How do you explain there shouldn’t have to be a conflict? 'I think some businesspeople are rather like the Tea Party in America, who live in the eighteenth century, where they think there should be no rules and where they should be given maximum freedom, which is completely unrealistic. And you can even argue: So you want to break the rules? Are you then going to pay 774 million euros because you manipulated the Libor rents? And that was Rabobank, which was the primary ethical bank in the Netherlands. Actually, enlightened self-interest would have saved you 774 million euros and your reputation. If I would replace the word ‘ethics’ by ‘justice’ when addressing these issues, would part of the resentment go away? The climate now is a bit like: if you are poor, it is your own fault. Doesn’t a lot of it come down to leadership? 'Exactly. It often goes back to strong leaders, many times the founding leaders. Of course you have to be competitive, of course you have to have shareholder value, of course you have to have continuity. However, they should not be excuses for all sorts of negative practices that not only damage the economy and environment, but are also damaging your reputation, which makes it more difficult for you to do business. A good start would be to have companies look at how they are facilitating this kind of behaviour, and at the structure of the system we work in. We can do things at our jobs that we do not consider unethical, until we see it outside the business environment, as individuals. People attacking Bono for tax avoidance, when all the businesses I work with invest a lot of money in tax optimization. Or you do not speak up when you see unethical business taking place. You transfer your personal conscious to the organisation. We saw it in The Netherlands with the housing corporations. 'And why is it that the housing corporations are different than they used to be? There may have been some double bookkeeping going on in the past, but they used to have an ethic of public service. What neoliberalism has done is opening up Pandora’s box and say ‘the sky is the limit’. You have people in universities in England for example, driven by huge sponsorships from Asia and the Middle East, really big money, as with business schools and law schools, so funding, production and status become dominant. The top person gets around 200.000 pounds a year, but the person who has a business background and comes to rebrand the university gets 350.000 pounds a year. So you see what I mean? We have gone through this period of so-called ‘toughening up governance’, with the Code Tabaksblat, breaking up the old boys network, more attention for supervisory bodies, etcetera, but nothing has changed because they do not get to the heart of the problem. We are handing over our conscious and our soul?